New Classic Children's Books for You! Are You a 'Civilized' Person? The March edition of the free AIM magazine is now online! This month's theme is 'The Tudors.' You'll be blown away by the amazing character dolls on display in "Genealogy in Miniature" and "King Henry VII & His Wives." Jean Day gives us a tour of fabulous Tudor real estate (miniature, of course). Many other aspects of Tudor times are brought to life, including falconry and birds of prey, pomanders, pewter and its uses, a history of blackwork embroidery, and food of the times. 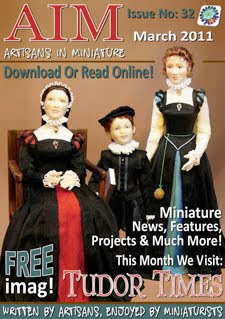 Free projects this month: Petit point cushions, Tudor Pottage (in any scale), brick making, a knitted Monmouth cap, and Tudor printables by Jean Day. CJ Cormier also presents part one of a three-part Tudor thatched roof project.